In one of the world’s most biologically diverse protected areas, you will have the opportunity to observe giant otters, black caimans, hundreds of bird species, tapirs, several species of monkeys, mammals, butterflies, orchids and bromeliads. A great view of the highest mountain in Cusco: Ausangate, Cloud Forest, Tapir Lick, Lake Blanco, Colorado. Cusco, Ausangate, Marcapata, Quincemil, Mazuco, Colorado, Tambo Blanquillo, Clay Lick. After an early departure from Cusco, we will drive for nine hours along the Inter-Oceanic Highway, including several stops to enjoy the scenery and take photos. One of our stops will be at the Pirhuayani Pass (4725 meters / 15583 feet), from where there are fine views of the snow-capped peaks of the Vilcanota range, including Mount Ausangate (6380 meters / 20920 feet), as well as the high plains grazed by llamas and alpacas. 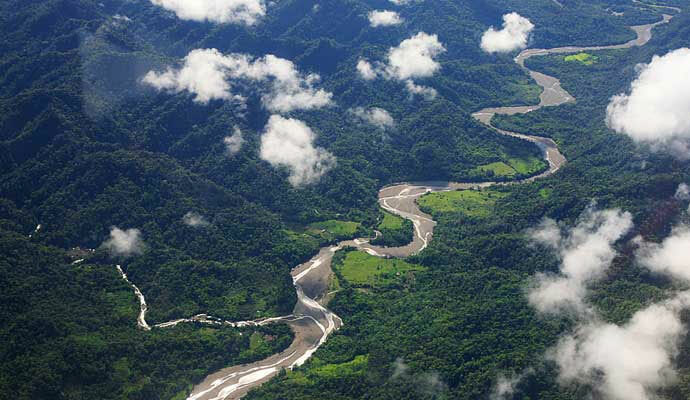 From this pass we will begin our descent of the eastern slopes of the Andes, passing through cloud forest and entering the lowland rainforest at the Inambari River. We will arrive at Mazuco in the afternoon. At this gold mining village we will spend the night in a local lodge. Our first full day in the forest will begin with a typical local breakfast, after which we will be driven for half an hour to the Inambari River. The river crossing takes about 10 minutes, and another vehicle will be waiting for us on the other bank, from where it is a one hour drive to Boca Colorado mining village. A boat will be waiting to take us upstream along the Madre de Dios River as far as Tambo Blanquillo Lodge. Our day will be spent enjoying the forest and looking out for wildlife on the riverbanks. These forests are home to cocoi herons, purplish jays and many other birds, as well as caimans and many of the 13 species of monkeys that inhabit Manu National Park. We will arrive at Tambo Blanquillo Lodge in the early afternoon. After your evening meal you will be offered the chance to take a nocturnal walk in the forest around the lodge. In the early morning, before breakfast, we will take a 30-minute boat ride as far as the special observation post located just 30 meters (90 feet) from the clay lick, or “collpa”; a mineral-rich clay deposit on the riverbank. From our camouflaged blind we will be perfectly placed to observe them as several species of parrots and macaws arrive to feed on the minerals essential to their diet, creating for us a colorful and noisy spectacle that is an unforgettable experience. You will be served breakfast in the hide. After observing the activity at the lick, we will return to the lodge. After lunch, our day will continue with a boat ride to the Maquisapayoj Lodge. After our arrival, we will walk through the primary rainforest for about an hour and forty minutes to the tapir lick. An observation platform has been installed here, from where it is possible to see tapirs as they come in search of mineral deposits to feed on. This species is nocturnal and we will spend the night at the platform, which is fully equipped, before returning to our lodge the next day. After a good breakfast, you will have the whole day to enjoy Lake Blanco. This oxbow lake habitat is home to several fascinating species. Here it is possible to see giant otters, caimans, turtles, the primitive hoatzin bird, snail kites, brown-throated three-toed sloths, red howler monkeys, squirrel monkeys, white-fronted capuchins and brown capuchins. In the afternoon we will visit Lake Camungo and climb up to our observation point in the canopy, 42 meters (137 feet) above the ground. This is the perfect place to look out for toucans. After plenty of time to observe local wildlife, we will go back to the lake for another chance to spot giant otters, before returning to the lodge or opting to spend another night spotting nocturnal tapirs. We will board our boat in the early morning for the two-hour trip to the gold mining community of Boca Colorado. Here we will be able to observe for ourselves how these illegal mining activities affect the rainforest environment. From here it is a one-hour ride on local transport as far as Puerto Carlos, where we will board a local boat for the short river crossing. On the opposite bank, our transport will be waiting to take us along the Inter-Oceanic Highway to Cusco. During this journey we will experience the dramatic changes in scenery, as we leave the forests and climb up into the Andes, crossing high plains on our way to Cusco, where you will be transferred to your hotel. Por el momento no hay informacion.